This Playmobil Pirates Treasure Island is a home for pirate crews, so enemies beware! It is well fortified with a functioning cannon, hidden trapdoor, and rock fall booby-trap to ward off any unwanted visitors. Hidden buttons on the rock archway can trigger either the rock fall to rain down stones on unsuspecting ships or the trapdoor to send intruders down into the cave cell. Stash all the pirate treasure in the secret cave behind the waterfall to prevent its discovery. 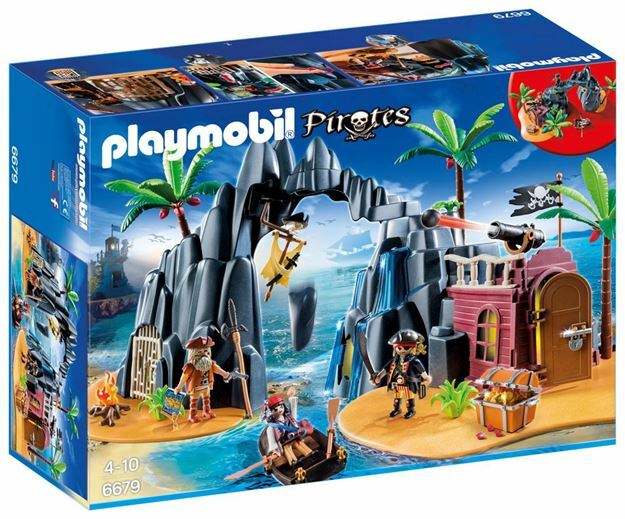 Includes: 3 pirate figures, a rowboat, rocky island with adjustable landscape, hidden cell, booby-traps, room with functioning cannon, campfire, swords, map, treasure chest with treasure and accessories. Part of the Pirate range. Age 4+ years. Distributed in New Zealand by Holdson.